What a fantastic gathering of the UK’s most enthusiastic and knowledgeable WordPress experts! We’re referring to WordCamp London 2016 of course. Over the past few days, a diverse group of the 34SP.com WordPress hosting team traveled to London to participate in WordCamp London and we all came away with memories and friendships to last a lifetime. The 34SP.com team set out on Friday in 2 large vans for transporting both our 9 members of staff and the booth materials including WordCamp London T-shirts, notebooks, Wapuu stickers and our display. Spirits were high as we blasted “London Calling” by the Clash in the van navigating our 3 hour journey to London. (Also heard during the trip was Scissor Sisters – I Don’t Feel Like Dancin’). Several times. On Saturday morning at around 5:45 am our day began, well except for Tim who decided to go visit the venue at 3 in the morning. Traveling the short distance from the hotel to London Metropolitan University we then began to assemble our stand and the swag we brought with us at around 7:00 am. 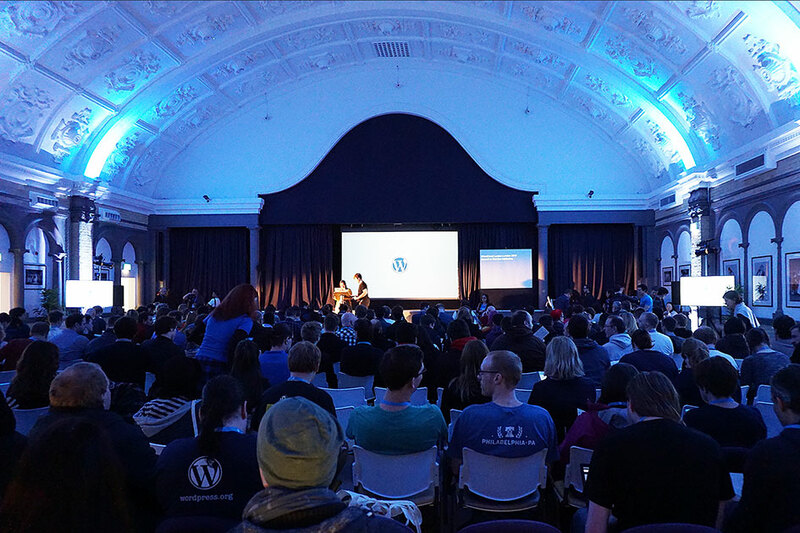 WordCamp London ‘officially’ opened at 9:00 am on Saturday with the opening remarks held at 9:15. Jenny Wong (lead organiser for WordCamp London 2016) presented the opening remarks in the Great Hall at London Metropolitan University which was constructed in 1897 and retains the original plaster ceiling. An appropriate room to start things off. Just after the opening remarks people started making their way to the 34SP.com stand. 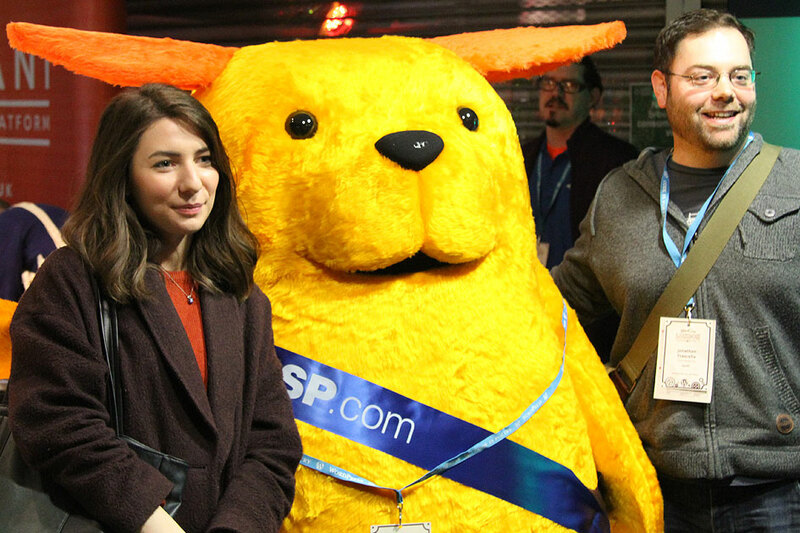 Our team was ready and enthusiastically began meeting all the attendees with Wapuu stickers and a warm smile. 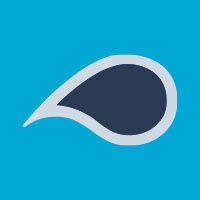 Our new managed WordPress hosting platform was now officially launched! At this point things were going well. Interested visitors chatting with us at the 34SP.com table, with t-shirts and notebooks flying off the shelves. And then things went to a whole new level: it was time to for Wapuu to meet his adoring fans. For those of you who aren’t familiar with Wapuu – here is a brief introduction: Wapuu was designed as the official mascot of ja.wordpress.org. 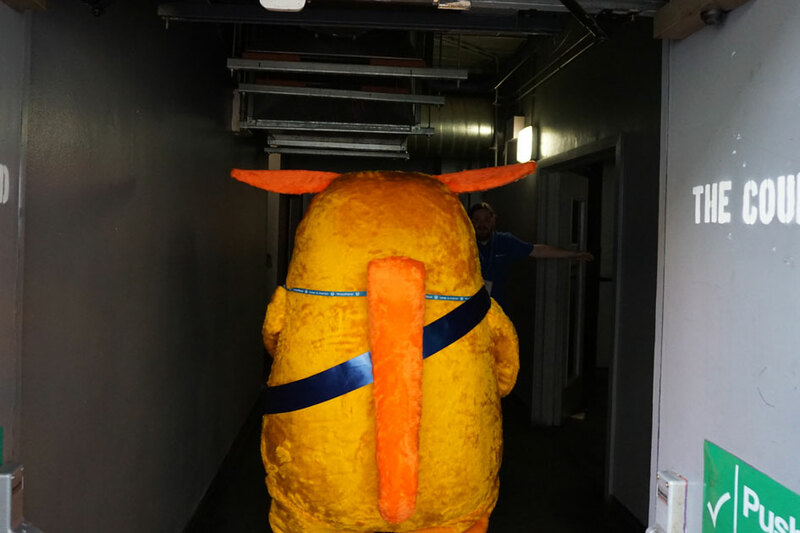 He has since become the mascot of WordCamps everywhere. Here is the original Japan WordPress page with Wapuu: ja.wordpress.org/about-wp-ja/wapuu. 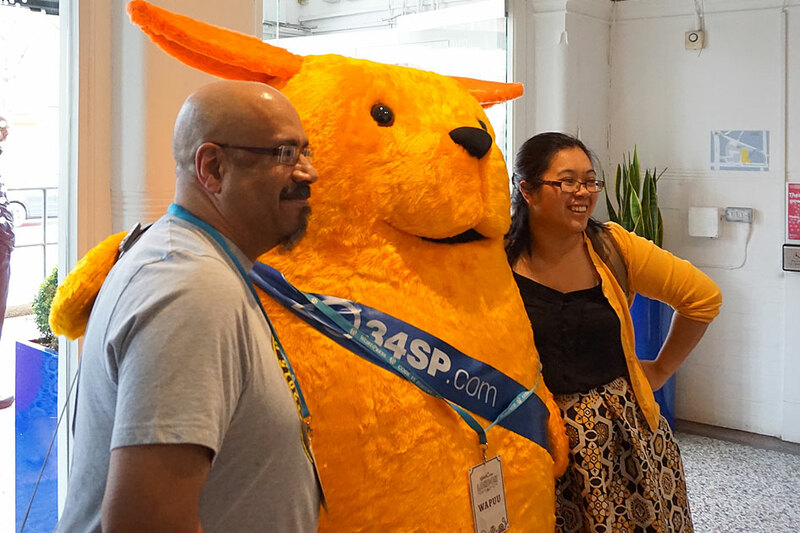 Our life sized Wapuu, imagined and designed by 34SP.com Account Manager Siobhan McMinn ended up stealing show as evidenced by the myriad photos and tweets. 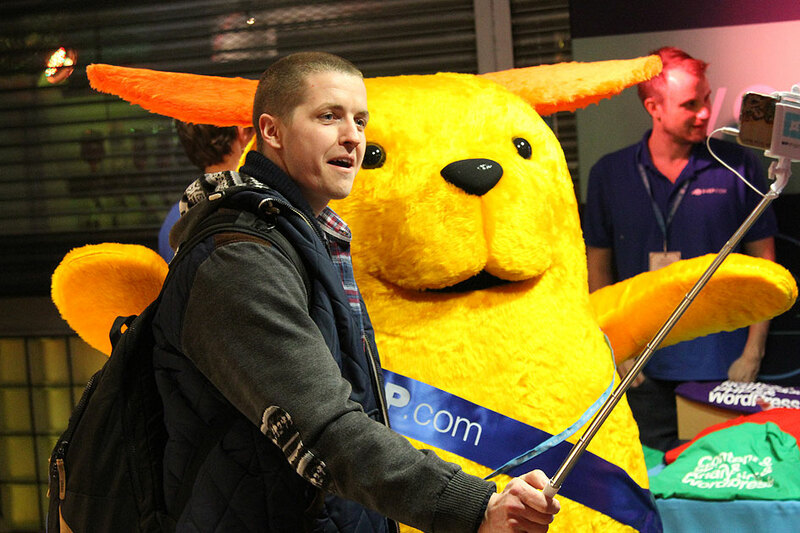 By all accounts Wapuu truly loved WordCamp London as well, discovering pie and mash for the very first time! 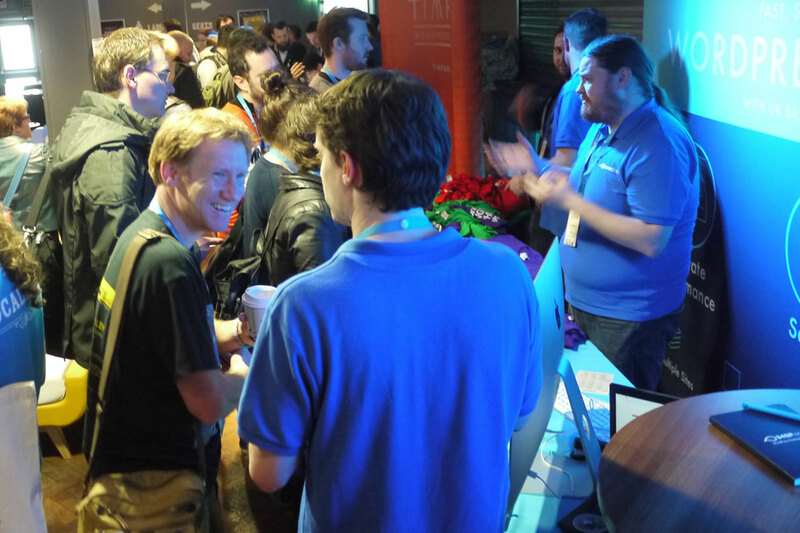 A brief summary of a few of the speakers we met and listened to at WordCamp follows. While of course the list is too long to include here – we truly do appreciate everyone who took the time and energies to either present or meet with us at WordCamp. Pascal Birchler presented ‘From Blogger to WordPress Core Committer’ as one of the first speakers. The most incredible thing about Pascal is not that he’s working directly on the WordPress core as a Core Committer at only 22 years old. The most incredible factoid he mentioned was that he began blogging at just 12 years old. Back then in 2006 he was blogging about school and YouTube videos. Among the stories related by Pascal was the time he broke WordPress.org and learned alot in the process. He’s also a carrier of Swiss chocolate and is very photogenic (he had some high quality photos of himself at WordPress events in his slides). Our thanks to Pascal for all he does for the community and his work in keeping WordPress up to date and bug free. 34SP.com’s own Tim Nash presented ‘Hacked Off: Dealing with a Hacked WordPress Site’ to a packed house in the Track C. You can read all about Tim’s experience at WordCamp London and see his slides in a separate special blog post soon. 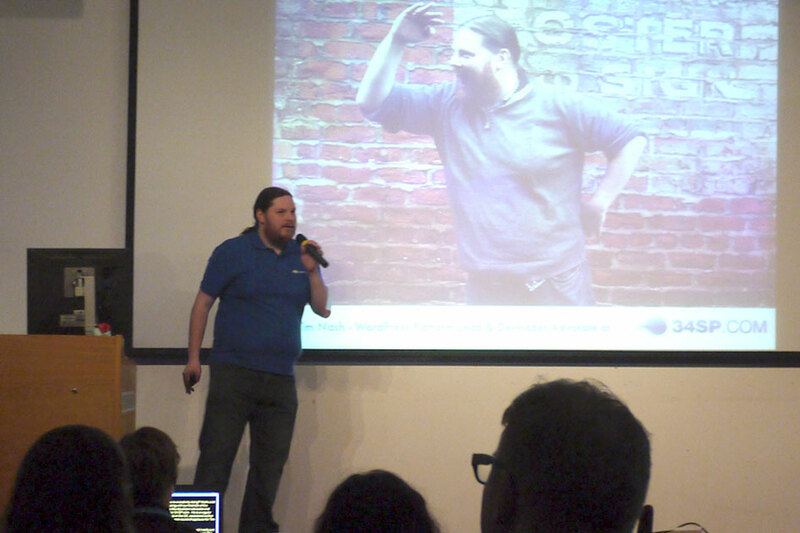 Rhys Wynne gave a talk entitled ‘Top Tools for WordPress SEO to use as Well as Yoast Stuff’. Prior to launching into his remarks, Rhys asked who in the audience was currently using Yoast: cue practically every hand in the audience going up! The great takeaway from Rhys’ presentation were the tools he revealed as being particularly useful to him in his SEO work including: Majestic – an all around SEO tool and backlink checker, SERPlab – an unlimited free tool for checking search engine ranking position (SERP’s), and AnswerThePublic for auto-generating subject matter in question form. You also get a visual representation of the suggestions generated. Rhys also had a number of resources for link building and outreach including HARO (help a reporter out), CrystalKnows.com – a tool for creating empathy in your writing, and checking Jetpack for ‘enhanced distribution’ of content. He also raved about the PageFrog plugin which allows you to easily publish and manage your content directly from WordPress to Facebook Instant Articles (FBIA) and Google Accelerated Mobile Pages (AMP) with full support for ads and analytics. Solid and practical information for everyone in Rhys’s talk. ‘Design Patterns’ was the title of the talk presented by Tammie Lister. This designer knows her stuff. Though deceptively simple, the approach to breaking down web designs into their constituent parts was powerful. Tammie mentioned examples such as the BBC website and the Boston Globe in her analysis. The exercise of creating a food blog entailed conducting thorough research, then grouping similar items, drilling down on the details and explaining the differences between a Pattern versus a Design Library. The reasons for examining patterns in websites according to Tammie? Speed (this streamlines website creation), iteration (building on good work already done), consistency, and understanding (everyone is working from the same foundation and language). She also related the Fable of the Fox and the Cat – which seems to really stick with you. Other illuminating ideas were everywhere at WordCamp London and are too numerous to call out in detail. Special mention to Ben Furfie for his ‘What I’d Do Differently If I Freelanced Again’ which he bravely admitted was the list of mistakes he made as a freelancer. 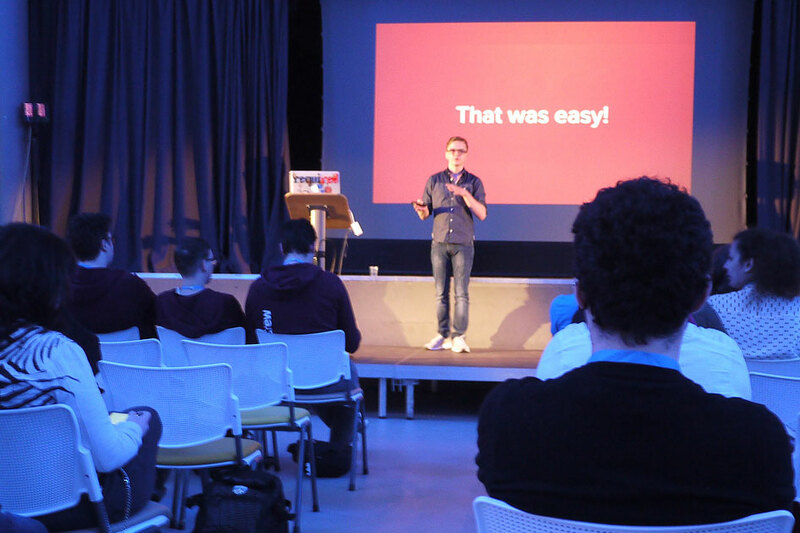 34SP.com client Ross Wintle also delivered a great talk entitled ‘User Experience: it’s for everyone’. It really got you thinking about how your website actually helps visitors get things done. Like real things that customers want to actually do. All wrapped up with the example of HasYourBabyArrivedYet.com. It’s not to much to say that for a first time presenter, Ross nailed it. So also a few words on the after party. Okay. Rock Band. That was EPIC. The giant screen and ‘concert-like’ sound system turned the Back Room into a club. Highlights? Daniel Foster nailing a 98% on Rock Band on the song by Rammstein – Du Hast. On ‘Expert’ mode. Note: it’s exceptionally hard to play on Rock Band. A surprisingly sentimental sing-along during Queen’s ‘Bohemian Rhapsody’. You’ll know what I’m talking about if you were there. Thank you to everyone in the WordPress community who visited our stand and participated with us on Twitter and social media during WordCamp London 2016. Our deepest thanks and gratitude as well to the show organisers and other amazing volunteers. Your efforts are appreciated – and none of this would have been possible without you! The 4 hour ride home on Sunday night? A bit rough in truth. But we were tired in a “good” tired way, and arriving back in Manchester felt bittersweet. It was the end of one adventure and the beginning of another. See you next year at WordCamp London 2017! Thanks for the great talk at WCLDN 2016, I especially enjoyed Tim’s talk about security and what to do if your site is hacked!